Take a trip through history with our interactive timeline. 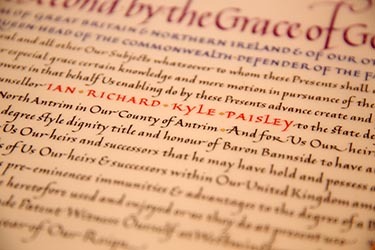 Ian Richard Kyle Paisley was the second son born to Rev James Kyle and Mrs Isabella (nee Turnbull) Paisley. At that time his Father was the Pastor of Armagh Baptist Church. 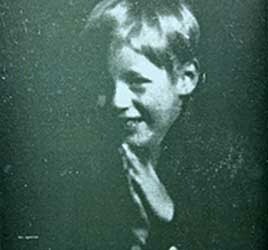 The family resided in Armagh until Ian was two years of age when they moved to Ballymena, where his Father took up the Pastorate of the Baptist Church in Hill Street. Some years later his father left this church and founded The Gospel Tabernacle, Waveney Road, Ballymena, an Independent Ministry which he pastored until his retirement. The family also resided on the Waveney Road. 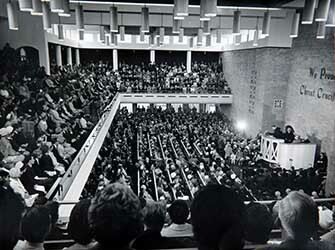 In time the Gospel Tabernacle joined the Free Presbyterian Church and after the passing of Ian’s Father it became The James Kyle Memorial Free Presbyterian Church. 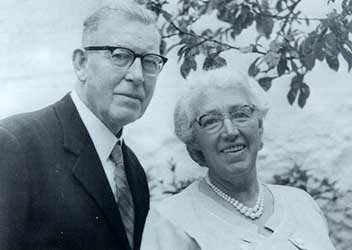 Ian’s younger sister, Margaret, married James Beggs who followed James Paisley’s Pastorate and served until his own retirement. Ian’s older brother, Harold, was also called into the Ministry becoming an Evangelist with the Christian Brethren. He first ministered in Northern Ireland and then in Canada to where he and his family emigrated. 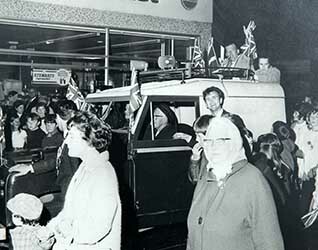 Ian’s Mother, Isabella, was a Children’s Nanny and a serving Sister in the St. John’s Ambulance Brigade, in Ballymena. She was a gifted organist and a talented children’s speaker. During meetings being held for children in Hill Street Baptist Church, Ballymena, at which she was the speaker, Ian, as a six year old, came to understand his need of a Saviour. His Mother had taken the story of the Good Shepherd, as related in John’s Gospel, for her theme. Ian clearly recalled realising that he was a lost sheep whom The Good Shepherd came to find. After the meeting he spoke to his Mother and together they knelt and prayed, Ian asking the Good Shepherd to become his Saviour. Ian’s formal training for the Ministry was taken first in the South Wales Bible College, Barry, Glamorgan, and then in the Reformed Presbyterian Theological College, Belfast. His Father, James, preached at his ordination service and other Ministers took part. 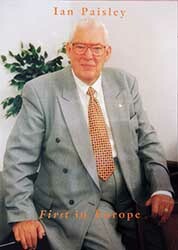 Ian served as Minister of the same congregation for 65 years. During that time his Ministry was uniquely blessed. He viewed prayer, and more specifically unity in prayer, as the foundation of an effective ministry. He maintained a prayer list of his congregations needs to which he referred daily when his many duties took him out of the city and the province. He was a believer in the “local church” and to that end strove to plant churches in the heart of communities. 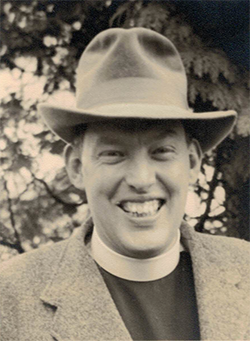 Under his leadership as Moderator of the Free Presbyterian Church which he founded, he was instrumental in the planting of more than sixty congregations. Most of these were as the result of local gospel campaigns often held in a tent or a loaned farm building. The Free Presbyterian Church was founded on St. Patrick’s day in the village of Crossgar, Co Down. 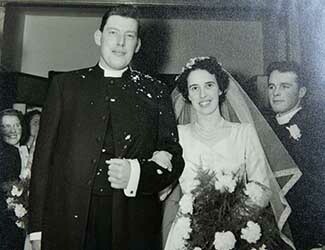 It was born out of controversy when Ian Paisley was closed out of the local Presbyterian Church Hall where he had been booked by the Elders to conduct a Gospel Mission. Those who aligned themselves with its stand were for many years despised. Many of those families had been for generations members of mainstream denominations and their choice to join the newly formed church came at great personal cost. However, the church put down strong roots and its evangelistic zeal was not to be quenched. Sadly, today, the same denomination lacks the leadership Lord Bannside provided it with as Moderator. The choice of its Presbytery to distance itself from him when he became First Minister of Northern Ireland marked a turning point in its spiritual effectiveness and removed at a stroke its ability to have an influence on the life of the province beyond its denominational remit. 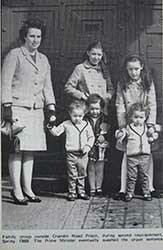 Eileen was the daughter of Thomas and Emily Cassells and was born in Belfast on 2 November 1931. She was a Secretary when she met Ian and went on to become a Member of Belfast Corporation serving the St. George’s Ward. She then was elected to both the Northern Ireland Assembly and Constitutional Convention serving East Belfast. She was elevated to the House of Lords in 2006 and took the title Baroness Paisley of St George’s. She was later joined in the Lords by her husband when he retired after serving in the House of Commons for forty years. They have five children – three daughters and twin sons; ten grandchildren and two great-grandsons. 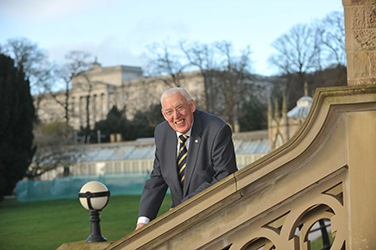 It was as Leader of the Protestant Unionist Party that Ian Paisley was first elected to serve the Bannside Constituency in Stormont, the then Government of Northern Ireland, and also to serve the North Antrim Constituency in the House of Commons. Before he became an elected representative he served two prison terms, one in 1966 and one in 1969. He refused to sign a bond which would have prohibited him from public proclamation and free expression of his beliefs. His first term was for three months which he served in full. The second was for six months of which he served six weeks, and then was released on amnesty. These sentences, rather than diminish his popular appeal and public allegiance, strengthened his followers who saw in him a man prepared to stand by his convictions no matter the cost. During this period Ian Paisley served as Leader of the Opposition until its disbandment in 1972. 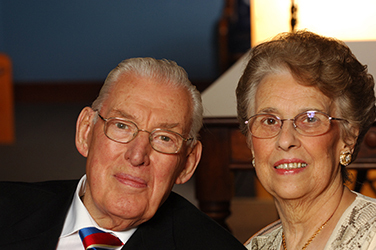 Ian Paisley served for forty years continuously in the House of Commons. He, along with his fellow Unionist MP’s, resigned his seat in opposition to the Anglo Irish Agreement, causing a by-election at which he was resoundingly re-elected. His personal vote in the North Antrim Constituency grew until it was over 50% of the votes cast – an unusual achievement for any politician! 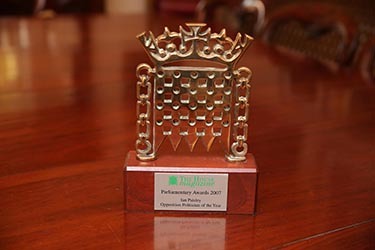 He was made a Freeman by both his home town of Ballymena and by the the Borough of Ballymoney in recognition of his four decades of service as their Member of Parliament. He also was the recipient of numerous other awards. On the eve of his retirement from the Commons the House commissioned his portrait to be hung in the Palace of Westminster. It was the first portrait of a Northern Ireland member in the history of the House to be commissioned and hung. Re-elected annualy, Ian Paisley was a much loved, trusted and dynamic Leader of the UDUP. Under his guiding hand and instinctive decision making the DUP grew to become the largest party in Northern Ireland, the largest Northern Ireland Party in the House of Commons, and have its first Members in the House of Lords. Topping the poll in every Province-wide election, every five years for a quarter of a century, galvanised Ian Paisley’s support, and enabled the Party he led to eventually benefit from his personal popularity and strengthen its wider position. 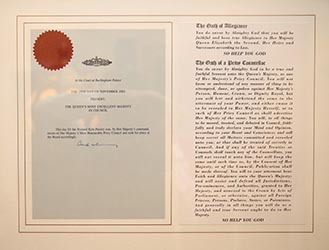 On the 15th November 2005, Dr Ian Paisley was, by Her Majesty’s command, sworn of Her Majesty’s Most Honourable Privy Council and took his place at the Board accordingly. 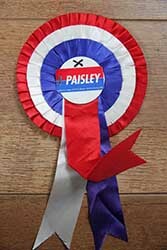 Having founded and led his Party during the course of four decades, as First Minister of the province Dr Paisley believed that according to the will of the people a new era had been embarked upon. While it was not without difficulty, he entered into this period of government with zeal and determination to secure a peaceful future for the province. His leadership was at this point unreasonably cut short by his own party. The effects of the manner with which he was dealt changed the nature of how the DUP operates. His forty years plus of public service in three Parliaments made Dr Paisley a valued and experienced asset to the House of Lords. He enjoyed serving and contributing alongside his wife and with former Commons colleagues of every Party. Both Lord Bannside and Baroness Paisley sat on the Crossbenches.